I like to draw women! 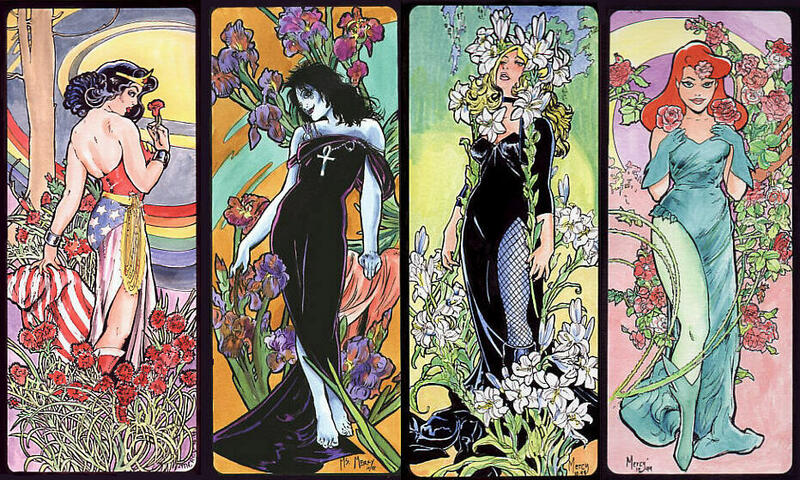 In an art nouveau Alphonse Mucha way or classic comic book super-hero, or Celtic, or with long ears and whiskers. Click on the pictures above for more stUFF. There is a limited bibliography of my comics work on the hosts page. There are more examples of my comics work on the comics page and here is my tribute to Wonder Woman for the San Diego Con Program Book. To see some examples of my inking, click here or here. We just added a page about my independent comic book company, Evolution Comics. 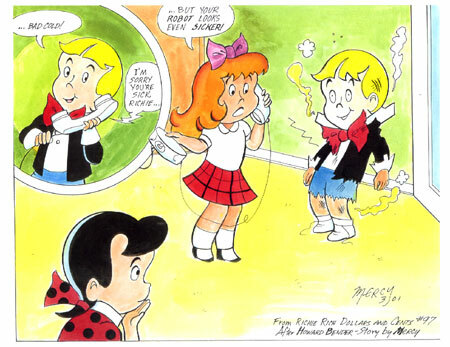 Below is a recreation I did from a story I wrote for Harvey Comics' Richie Rich Dollars and Cents #97. Originally pencilled by Howard Bender after my script and lay-outs. I wrote several stories for Harvey comics about the poor little rich kid. Very weird to think of a kid having a hang glider made out of thousand dollar bills and getting allergies to new bills. When Richie sneezes, he sez: �Cash-oo!� A lot of different people worked on Richie over the years including Ernie Colon and Howard Bender, but I was most interested when I found out a lot of women inked the comics from their houses. The suburban housewife picks up her pages on Monday and turns �em in a week later all inked and pencils erased, ready for the printer. Editor Sheldon Mayer said a lot of wimmin made the color guides for the printers of comics in the 40�s. Kavalier and Clay by Michael Chabon has some great bits about a lady cartoonist doing her Romance comic books, and I�d suggest you read it if you haven�t already, as it�s a great book. THE 'NUFF SAID! WEBSITE WAS CREATED BY ED MENJE USING VISUAL PAGE AND PAINTSHOP PRO. ALL CONTENTS© 2015 Ken Gale EXCEPT WHERE OTHERWISE NOTED.